This is another status update on Sherman’s torn ACL. 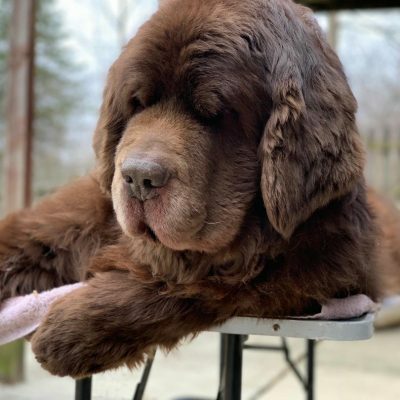 I have had wonderful feedback from interested readers about sharing Sherman’s journey with his injury, so I will continue to share as long as it is welcomed. Geesh, it’s already been just about 5 months since Sherman tore his cruciate ligament in his right knee and at the same time we learned that he had a partial tear in his left knee. You can read all about it here, here, here AND here. Last week Sherman had his 5th laser treatment and the awesome news is that the good vet said that both knees are now stable, range of motion is great and the swelling is gone! We will still continue the laser treatments but instead of having them done every 7-10 days we will do them every 3-4 weeks and see how things go. The laser sends a beam of light energy deep into the tissues of the body. This energy has several effects – it reduces inflammation and stimulates the immune system, and it increases blood flow to the area being treated, all of which speed healing. The light energy also causes the body to produce endorphins – the body’s natural pain relieving chemicals. Some laser machines, like the one that is being used for Sherman, also have an attachment which can direct a fine beam of light energy. 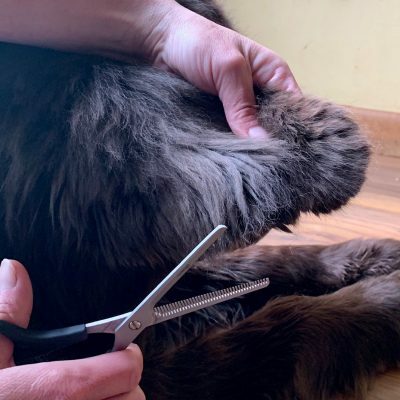 Vets may use this to stimulate acupuncture points, and use it as an alternative to acupuncture needles. The laser therapy will NOT repair his torn ACL. It is torn and will remain that way. What is happening is that scar tissue is forming outside of the joint which is helping to stabilize the knee. The laser treatment is suppose to be assisting in that process by making the tissue heal quicker and stronger, with hopes that the arthritis in the knee will be kept to a minimal for quite some time. Along with the laser treatment we are also doing a herbal concoction for ligaments and joints given to us by the holistic vet, Dasuquin, exercise, and range of motion knee exercises at night. I couldn’t be happier with Sherman’s progress. I was really concerned for the first few months that Sherman was losing too much muscle mass in his back legs and his back end seemed weak and he wasn’t himself, but I’ve noticed a big difference over the last month or so. I haven’t seen any limping in well over a month and the other day I noticed that when he was lifting his leg to pee, the other back leg that was supporting him, which was his right leg, was not shaking anymore, which to me means it’s stronger and stronger is good. Recently we have been given the green light to resume our regular walking which is a good thing because we have encountered a little issue. Sherman has gained 10 pounds since his injury and any extra weight on those knees is not what we want. I was expecting a little weight gain at first since his activity was restricted but 10 pounds is just way too much. Actually, any extra pounds right now could really set us back so we are working on getting those extra pounds off quickly but safely. Sherman isn’t all that fond of resuming his mile walks. No, you and Leroy go ahead. I’ll just lay here and wait for you to get back. Um, no Mr. Chubs. You’re coming too. In order to try and get Sherman back to enjoying his walks we’ve been trying to change things up and go for walks in different areas around our house, the new sidewalk has been working very well all week and I think last night Sherman even had a little jump in his steps. All in good time. All in good time. I also wanted to make sure that I made it clear that while this therapy is working well for Sherman it may not work well for other dogs. ACL injuries are the most common injuries seen in dogs and as a responsible dog owner it is up to you and your veterinarian to explore all the options available for your dog and determine what options are best for them and you. Age, lifestyle, commitment, health, and money are all things to take into consideration. Sherman was not a good candidate for surgery early on because he had a partial tear in his left knee and the chances that it would of become a full tear while the right knee was healing from surgery was very likely so the plan was to get both knees more stable and go from there. Well we are there and as of right now we will not be pursuing surgery. I have spoken to both of Sherman’s veterinarians and they agree, that if things keep heading in this direction, surgery will not be necessary. So paws crossed that we keep heading in the right direction. ***Dexter from Fidose of Reality recently partially tore his ACL and Carol is blogging about their journey with his injury. You can read her recent blog post about it here. Dexter wasn’t having much success with the laser therapy so they are now moving on to a knee brace for him. What great news Jen! Sounds like the laser treatment is really working and Sherman’s improvements are promising. So glad to hear he is on the mend. Thank you so much! I’m so happy with his progress, but also cautious. Fingers and paws crossed! Haha! 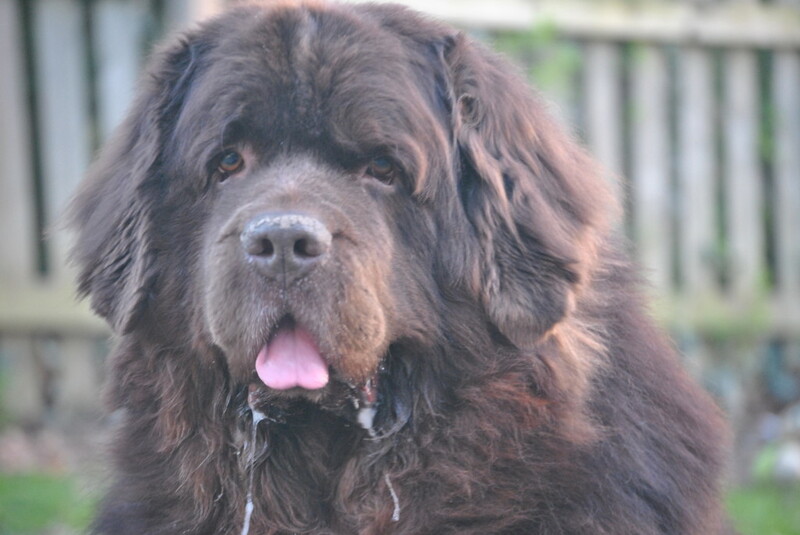 Yes it’s all hair and slobber! Sounds like it’s all good so far. Paws crossed that the laser treatment is a success. We’re so happy he can get out and walk now…even if he’s not too happy yet. Thanks so much! I have to say I was skeptical at first that the laser would work well for Sherman. I thought surgery would be inevitable because of his size, but I think we may have had a lot of things come together nicely! Glad to hear Sherman is doing so well! Perhaps I should look into it for my own issues! Lol Jeanne! I feel the same way!! I need some laser therapy and acupuncture too! What a great update! I wish this treatment option had been available years ago for Tucker. I would definitely have given it a try! 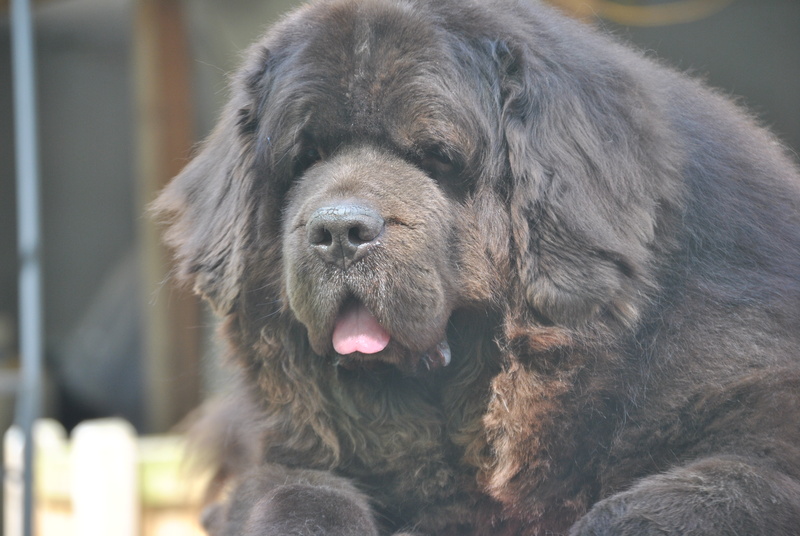 It is a wonderful option, and I felt the same way about my first Newf who had DM. Not sure if it would of helped but I would of loved to of given it a try! Glad he is doing better. Maybe he needs to have a cute female dog to lead him on his walks for motivation??? We learned about laser therapy last week for arthritis with my sister. We are trying some other options first but that supposedly helps lots of dogs with that too…who knew! Haha! Yes, a lady friend and maybe a steak would get him motivated! Hope that Katie is doing well with her arthritis. There is just so many options available now to assist them, best of luck! Glad to hear the laser therapy is working for Sherman! I wonder if it would have worked for Riley…it wasn’t suggested to me for her. Keep up the good work, Sherman! Thank you!! I don’t know about Riley and the laser therapy, I think it may have helped but she is so active I think you made the right choice with the surgery and she seems to be doing super! I am sooooo happy that Sherman had such wonderful results but I feel so bad that Dex didn’t. Wonder why it is so good for one and not the other? Thank you for this wonderful series! Thanks Caren! I think it has a lot to do with the activity level of the dog. 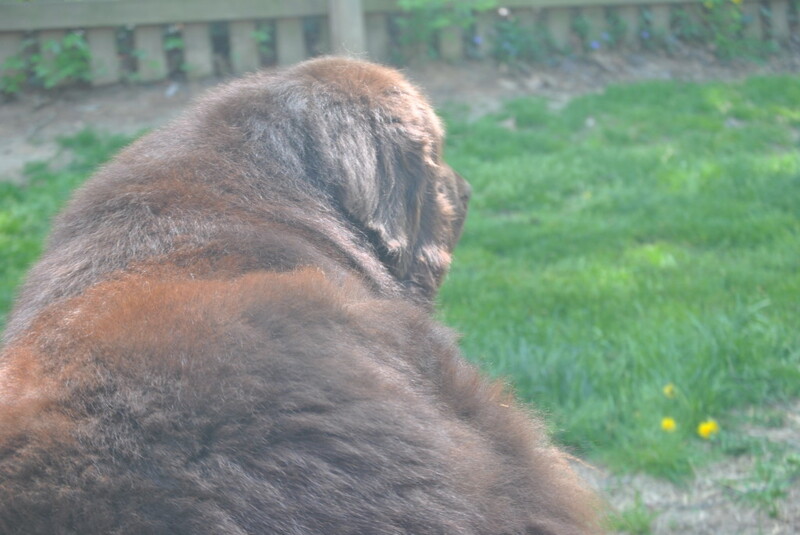 It was pretty easy for us to limit Sherman’s activity and he was ok with that. Dexter seems like a much more active dog than Sherman, so maybe that’s why it didn’t work so well. Maybe? I’m not sure if we would have the same good results with Leroy as he is much bigger and more active. Wow! I’m impressed! I wish I’d known about this option a year ago. My mom’s dog had several cancer surgeries and he jumped off the bed and tore both his ACLs. The vet refused to do surgery because of the cancer treatments, and the little guy was miserable for the last months of his life. This could have been a good pain relief option for him! Aw. I’m so sorry that your Mom’s dog was in so much pain. I wish this option would of been available with my first Newf too. He had a bad heart so surgery wasn’t an option and this would of helped him in so many ways. Thanks Gizmo! I’m glad we have been able to share our experiences! Wow I’m super happy to hear how successful the treatment have been! I really hate go have anyone/pup have surgery unless its totally necessary. Thank you and I hear you! While I’ve seen many dogs do awesome with the option of surgery for an ACL tear, I just don’t think it was the way to go with Sherman. That’s great news Jen! I try and always find a different approach to traditional medicine. It seems like you chose a good one!! Thanks Jodi! You know, this is all new to me. Taking a different route than traditional; medicine and I have to say I really like it! I wish I would of been more open to it in the past and allowed myself to explore! 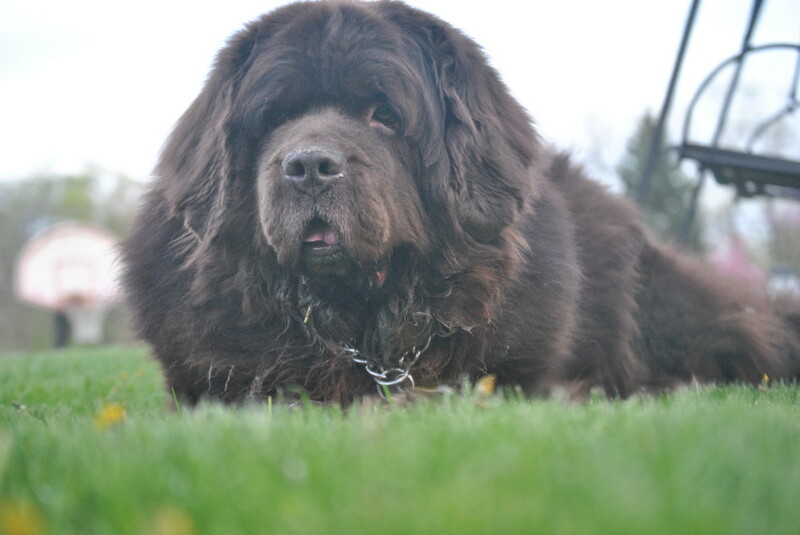 So glad to hear he’s improving…..Do Newf’s tend to be low energy dogs? I know my next door neighbor’s was, but I think that was due to having a low energy owner ;-). And of course the poor boy was way overweight. A lot of Newfs are extremely laid back. 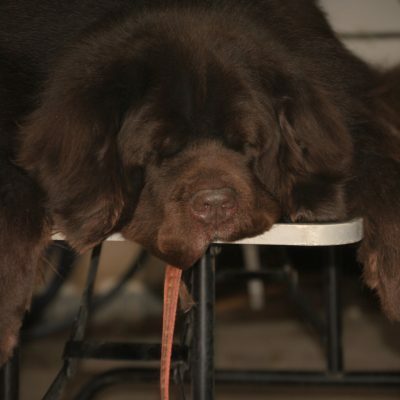 Sherman is very laid back and low energy where as Leroy has a lot of energy. My first Newf had a lot of energy. 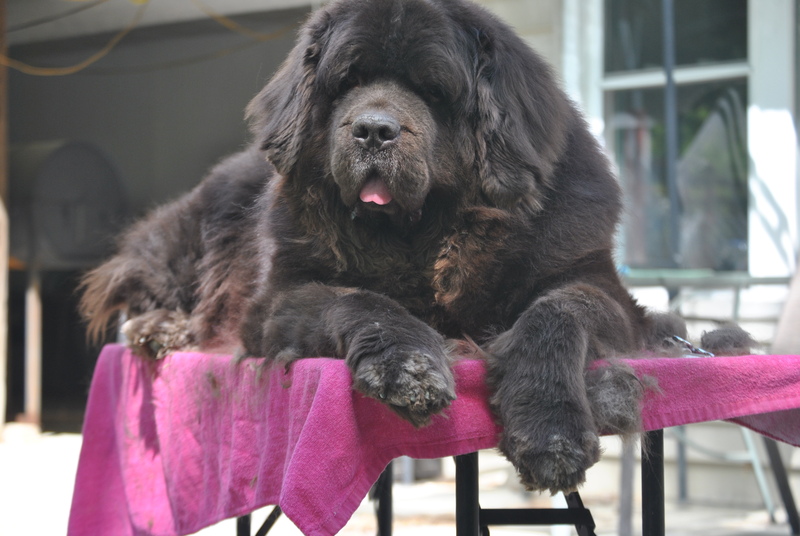 Newfs tend to want to be with their owner so if their owner is active their Newf probably is too. Sherman would like to be active with me by laying out in the front yard while I cut the grass while, Leroy would want to be walking right along side of me. 🙂 Does that make sense? Thank you and you join us for a walk anytime! So happy to hear things are improving! Laser therapy sounds like a very good thing. It’s great that you are sharing the experience. Thank you Jobi and Fisher! Modern veterinary procedures are so amazing. Thanks for the update. It is soooo good to hear that the laser treatment is workin’ Sherman! Ma chuckled about you gettin’ chubby….somethin’ about MOI puttin’ on a couple of pounds. Thankfully, I’ve almost lost all my chub, and only have 3 to go!! Butts, Ma still worries about my joints in the upcomin’ years with all my jumpin’ and stuffs. So I HAD to go on a diet! pffffft!!! Anyhu, Good luck dude, it won’t be fun at furst, butts spendin’ more times with Moms will be the reward!! Than you Ruby and that is so great that that you lost almost all your chub! Sometimes that is so hard to do! Best of luck on the last 3 pounds! I recommend that you roll whatever Sherman’s favorite food is all over yourself – then you walk in front of him while your hubby has a hold of his leash – you can be like the carrot at the end of a stick! Glad to hear the therapy is working for him though – that’s great news!! Haha-I would be like steak on a stick! oh, i love good news! so glad to hear the laser therapy is working for him! i’m sure he’ll drop those few extra pounds as soon as he gets back into his walks. Sounds like he’s doing great – except for the extra 10 lbs. I know how that goes, Sherman! I like try to stay on the sofa when the hubs offers to walk Rita, but always drags me along! (I try the “but I already walked her once today!” excuse but it doesn’t always fly.) You’ll enjoy it once you’re out there, Sherman! Yep-I know how that goes too! At least now he’s my motivation to get up and walk or else I’ll be paying for a new knee! Awesome news! 🙂 You are the first we’ve known to have the laser treatments and we are so happy to hear how well they are going. Thank you for keeping us up to date and informed! I wish we had known about this all those years ago when Zeus had TPLO surgery on the one knee, and then we left the second as is. I bet laser treatment would have benefited him greatly. We actually just switched him for our “various glucosamin/msm/everything-but-the-kitchen-sink” vitamin regimen to Cosequin DS Plus MSM and I’m hoping we see some improvement. Thanks Nichole! So far it has been a great experience! We recenly switched to Dasuquin plus MSN and it has been great! I can give a lot less of that then I was of his other joint supplement! We’ve never tried Cosequin but I’ve heard good things about it! Hey there, I just realized you were responding to our comments here… I wonder if there’s a “notify of follow up” button to check… lol. Anywho, I looked up both Cosequin and Dasuquin and it looked like (it my haze of trying to look at everything at once) they are made by the same company and are very similar. We’re only a few days into it with Zeus, but I *think* I already see improvements! Thanks for the shout out to Dexter. I really enjoy your blog and you have a great conversational style of writing. I wish Healing Prayers and hugs to Sherman as he continues this journey. We just got our stifle brace tonight and I will be blogging about this over the weekend. Thank you for the kind words Carol! I’ve enjoyed reading your posts about Dexter, wish it wasn’t something that he and you had to deal with but it’s nice to compare experiences and other options. Best of luck with the brace and I will look forward to your next post! I am so happy to hear that Sherman is doing well with his laser therapy! He has made a lot of progress. I hope he continues to do well! Thank you so much Marquie! Laser therapy is amazing! My 10 year old golden boy Harley partially tore his CCL and had a few months of laser and physical therapy. He was doing great and we were all very happy. Unfortunately, one afternoon, he saw a deer in the woods and took off after it. He came back on 3 legs. He had totally ruptured it and we ended up doing surgery. He did very well and recovered quickly. Laser therapy and Pt were very key in his recovery. When he tore his other CCL a year later, we opted to go directly to surgery. Once again, Harley recovered well with the help of laser therapy. He actually had his first session the day after surgery. The therapist came to our house. It is a year later and Harley is once again chasing deer (literally) on 4 very strong legs. What a wonderful success story Teresa! So glad to read that Harley did so well with the surgery and he sounds better than ever! Chasing deer! What dog doesn’t love that?! Yes! I was really nervous about his back legs getting weak. I’ve been through that once and I want to do all I can to not have that happen, or do all I can to slow it down. I hear you about putting the pounds on easily. Sherman’s never been very active but I always did my best to keep him moving so he never had a chance to really pick up a lot of weight. I knew it was coming with the restricted exercise, but I didn’t want it to be as much! Thanks for sharing your experience and for explaining why Sherman did not have the surgery. I was wondering if it was a new procedure for treating ACLs (if only!) that would be less invasive. I am so glad Sherman is doing so well. Several of my dog’s friends have torn their ACLs. It is such a long recovery process. I worry about Jasper tearing his all of the time because Jasper is so careless with his body. He never stops to think about the tree in his path. Good to know there is another option depending on circumstances. Thanks Mel! This has always been my worse fear with the Newfs. I use to always yell when they ran out the back door-“slow down, you’re gonna teat your cruciate!” Then it happend and I was devastated! One thing that I did want to make clear was that this will not repair his ACL and I’m glad that came through clear this time. Thanks for sharing this. It is very interesting. I hope Sherman continues to improve! So sorry to hear about hip and elbow dysplasia Miss Harper Lee, but it’s so great that you have found things that help so much! We have been looking into pursuing hydrotherapy too, if needed! So glad there are so many options available now! Best of luck to you! Way to go Sherman! This was a great post, and I think it clears up some misconceptions about laser therapy. Plus, I just appreciate people who make their own decisions on what’s best for their dog and not just jump right into surgery just because their vet said so. That was were I was when my dog tore his ACL. Vet way saying surgery and I was not sure my dog would be able to handle it (age). I got my own second opinion and went the brace route with a brace from WoundWear. It was a good choice for us.